The final match of the first half of Pro Kabaddi saw Patna Pirates and Bengal Warriors draw 20-20. The home side trailed for most of the match, but rallied at the end to avoid a loss in the last match of the Patna leg in a low-scoring encounter. Both the teams did not let the other any space and till the 8th minute, it was even-stevens as the scoreline read 4-4. Vineet Sharma and Dinesh Kumar scored a point each to give Bengal Warriors the lead a 6-4. However, the home team were not to be outdone and Ravi Dalal returned successfully while Dinesh Kumar was caught in the subsequent raid as the match was back on level terms in the 11th minute. Jang Kun Lee helped the away team restore their 2-point advantage in the 15th minute, but the home side roared back again to level the score at 9 each after Sandeep Narwal’s team caught substitute Mahendra Rajput with 3 minutes to go for half-time. Bengal Warriors broke away in the final 3 minutes as they ended the half in the lead, 12-9. In the absence of Rakesh Kumar, Patna looked a bit fragile as they definitely missed his experience in the first half. Bengal coach Raj Narain Sharma would be happy with his team’s performance in the first half. Pirates raider Gurvinder Singh started the second half with a storm, winning 3 points in his first 4 raids of the half to keep his side just 1 point behind the challengers. Both the teams kept on taking a point each till the 30th minute when the scoreline read 15-14 in favour of the team from West Bengal. Jang Kun Lee made it a 3-point lead for the away side after scoring 2 points from his raid in spectacular fashion. Deepak Narwal levelled the score at 17-17 in the 35th minute before the home team finally took the lead when Vineet Sharma was tackled in the next raid. It was the Jang Kun Lee show from then on as the South Korean helped his side stay level with the Pirates and in the final minute both teams were level at 19 a piece. 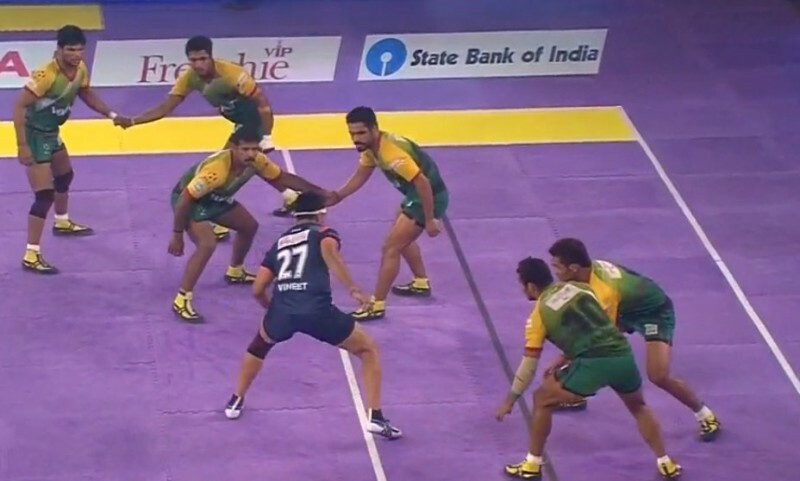 Patna Pirates captain Sandeep Narwal went in for his side’s final raid, which was also a do-or-die raid for his side. He was tackled by the Warriors as the away team led by 1 point with a little over 20 seconds left in the match. Lee went in for the do-or-die raid for the Warriors, which was also the final attack of the match. The 22-year-old failed to come back with a point as he was caught by the home team’s defenders. This was the first draw of the second season of Pro Kabaddi as Patna Pirates ended their home leg with 2 wins, a loss and a draw. The home side, courtesy of a stellar performance at home, propelled themselves from last to 4th in the table.